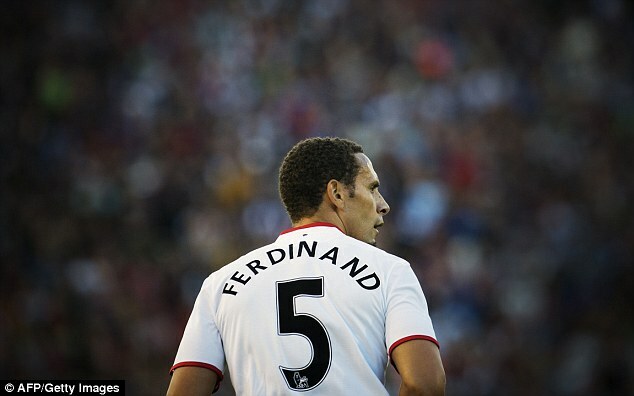 Former Manchester United defender Rio Ferdinand has joked that it's 'time to get back training' after he found out that his old No 5 shirt is up for grabs. Marcus Rojo has made the switch to No 16, meaning that No 5 previously worn by Ferdinand is currently without an owner. After joining Manchester United from Leeds in 2002, Ferdinand wore the No 6 shirt for a season before switching to No 5 in 2003. The centre-back went on to wear that number for the remainder of his illustrious spell at Old Trafford, which lasted until 2014 and saw him win a host of trophies, including six Premier League titles and the Champions League. United were left frustrated after failing to bring in a new centre-back during the transfer window, and it is possible that the No 5 shirt is being kept free for a new arrival in January. One fan, @GreggyCo, replied to Ferdinand's tweet by saying: 'Come back!!! Bring back the Man Utd mentality'. Another, @Josh_Deegan, claimed that Ferdinand would still be a better option than some of United's existing centre-backs and also called for the return of Nemanja Vidic. He wrote: 'You'd do a better job than Smalling and Jones pal. Wanna give your mate Nemanja a ring and see if he's free too?'. Meanwhile, @Murph786 wrote: 'You’ve still got it. #Rio5 #TheReturn'. In addition, @Ryanmufc95 wrote: 'What I'd give for a prime rio, with the armband at the back in the current team'. Following a short spell with Queens Park Rangers, Ferdinand announced his retirement from playing in 2015.